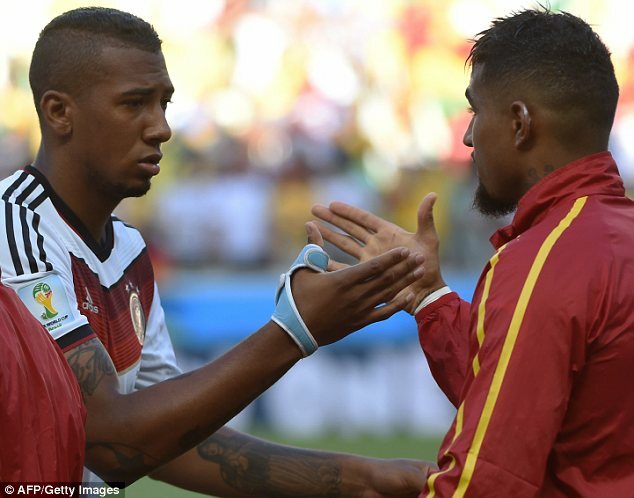 German international of Ghanaian parentage, Jerome Boateng is in Ghana for the first time in his life. The Bayern Munich ace is celebrating the Christmas holidays in Ghana with is two daughters Soley and Lamia, as well as his sister, Avelina. Boateng started his career at Hertha BSC where he developed from the youth ranks to the main team. After his first season at Hertha, he soon signed for Hamburger SV and established himself as an integral part of the team, helping Hamburg reach the two consecutive UEFA Europa League semi-finals. Boateng is the younger brother of Ghana international and Sassuolo midfielder, Kevin-Prince Boateng. The pair were born to a Ghanaian father but different German mothers. While Kevin played for Ghana after being snubbed by Germany, the defender opted for the European country but he is a keen lover of Ghana with the map of Ghana tattoed on his shoulder. Boateng's kids playing at the Labadi beach. Jerome at Sky Bar in Accra on Thursday night.